“Hiatus”/“Business & Pleasure” / "“Hiatus”/“Business & Pleasure” "
Talk about TV shows or films about the creative process for long enough and you’ll run up against this old critical saw: Most art about fictional art ultimately fails because the song or play or painting its characters produce can’t possibly live up to the praise it receives from within the piece. I don’t entirely buy into that argument—because if the quality of, say, the film-within-the-film is lacking, does that really drag down the piece as a whol but I can see where its opposite applies to a film like Almost Famous, where the music of just-alright boogie-rock act Stillwater sounds like any just-alright boogie-rock single that’ll turn up between the monster hits on your local classic-rock station. Home Movies finds its own way around this pitfall: Because its main characters are still in elementary school, there’s no expectation that the movies they make will be any good. In fact, they’re usually as bad as you’d expect short, highly derivative home movies made by 8-year-olds to be: In the legal drama that opens “Hiatus,” the dialogue is leaden, the acting wooden, and what begins as down-to-earth divorce proceedings (albeit with the unconventional twist that Melissa’s character is representing Brendon and divorcing him) devolves into feverish scatting from Brendon and Jason. In that regard, the primary challenge of the filmmaking segments in Home Movies was writing and animating mini movies that were bad, but still entertaining. Jason is correct in saying that the “Hiatus” movie is “an alternative to good,” but the “fight with jazz” segment is hilarious—an early comedic high for this second season. But the viewer’s pleasure is the kids’ pain, and thus “Hiatus”’ main plotline kicks into gear: In order to recharge their creative juices, Brendon suggests he, Melissa, and Jason take a vacation from filmmaking. 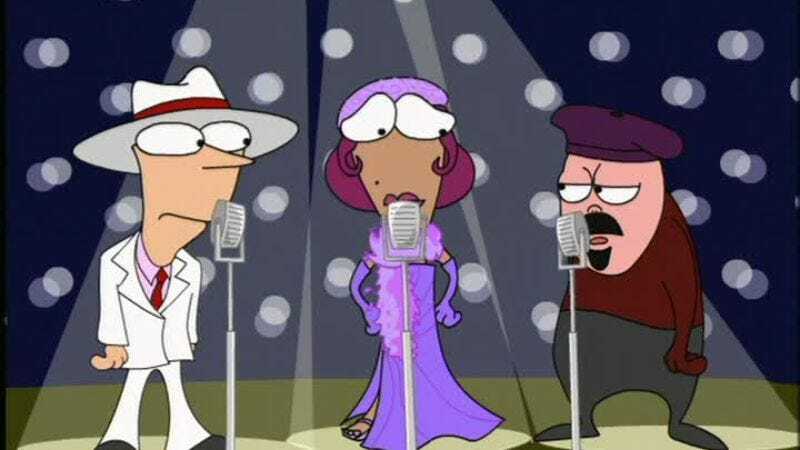 “Time off” provides the thematic engine for all of the episode’s storylines: While Brendon tapes Scäb practices and serves as the world’s worst roadie, Coach McGuirk plans a Mexican vacation with Mr. Lynch (though only after failing to get Brendon to come along to take further advantage of a group rate) and Paula takes an involuntary leave of absence from teaching. There isn’t a bum note in any of these threads, each of which starts from a basic character trait (Brendon needs a creative outlet) or previously established dynamic (McGuirk bullies Lynch, Lynch annoys McGuirk, Paula can’t figure out how to handle Arnold Lindenson’s “crazy energy”) and heightens, heightens, heightens. It’s all Home Movies 101, but it’s incredibly effective—particularly in McGuirk and Lynch’s corner of the episode. H. Jon Benjamin and Ron Lynch struck something special with this antagonistic friendship, and it’s truly satisfying to watch Lynch tip the seesaw when the characters get to Mexico. I have a hunch the characters needed some extra-legal assistance to return to the States following Lynch’s little bender. While “Hiatus” is busy pushing McGuirk and Lynch together, it forces Brendon, Melissa, and Jason apart from one another, providing the template for my favorite type of Home Movies episode. (And serving as the dry run for what’s possibly my favorite installment of the entire series, the season-three première, “Shore Leave.”) There’s a spectacular chemistry between Benjamin, Brendon Small, and Melissa Galsky, but to appreciate how well those actors (and their characters) work together, you have to understand how they function apart. Which is to say “poorly”—but “poorly” as in “the jazz fight at the end of the divorce movie went over poorly.” The friendship stops short of codependence, but Brendon’s blundering in the presence of “fancy dance-y” choreographer Cynthia demonstrates the important social safety net that Melissa and Jason provide. “Hiatus” effortlessly shows how these characters are made for each other, even if their clinginess is a byproduct of their bond: Jason has it so bad in this regard that he’s instantly pulled toward Walter and Perry—though the power of their connection is such that it ultimately turns repellent. The straw that breaks the hiatus’ back is a telling character detail: Following a blissful, if not entirely convincing diary entry about his non-filmmaking activities (“I’m playing for the first time and making new friends. I realize now what’s been missing from my life: Fun”) Jason loudly and proudly declares that he can’t play forever. He has to return to the weird, prematurely mature form of playing that he does with Brendon and Melissa—a hobby that’s portrayed more like work than anything the adult characters do for money. This is the other way Home Movies dances around the limitations of art about fictional art: The series convincingly and humorously shows the importance of Brendon, Melissa, and Jason’s goofy little movies. And it’s not enough to simply illustrate that importance—episodes like “Hiatus” make us feel it as well, through Jason’s loss of patience with Walter and Perry, Melissa’s growing expertise in the ways of moping and lurking, and Brendon’s grasping for a vessel, any vessel, to pour his creative energies into. And in comparison to what “Hiatus” turns up, jazz fighting ends up looking like the best use of those energies. Because the scatting only gets worse after the hiatus. And then there’s the flipside of that thought: Sometimes the kids aren’t so much friends as they are coworkers. This should be a familiar situation for anyone who’s undertaken a creative endeavor with a friend, a scenario that splits the relationship into two uncrossable streams. (Or two potentially colliding worlds, depending on the pop-culture metaphor with which you prefer to work.) When Jason—who’s spent an entire shoot interrupting Brendon and Melissa at earlier and earlier intervals—invites Brendon to spend the night, it initiates a chain reaction that ultimately alters the entire makeup of The Blind Date. Brendon’s correct to have a Constanza-esque meltdown about Movie Jason rearing his ugly head in the middle of the playdate; if only he could’ve predicted that Movie Jason has a legitimately ugly head—or that the ugly head is named George. Jason, George—yeah, the show is definitely working in Seinfeld territory here. Brendon’s lack of control in “Business & Pleasure” is a fun reminder that, in spite of all his pretensions toward calling the shots, Brendon’s still a kid. That’s underlined by Jason and Melissa’s behavior in this episode: The neediness of the former carries over from “Hiatus” (and several first-season episodes, too), but I’m at a loss trying to remember if Melissa’s play with the cookies is the first sign of her particular shrewdness. She’s always been portrayed as the smartest of the show’s core trio, but this feels like a new side to the character, one that recognizes she can play two members of the Small family to swipe her Blind Date lead role from Jason’s clutches. The kids hurt each other almost as often as they help one another, a complexity that takes most shows more than 17 episodes to develop. Fortune refuses to smile on the Smalls this week: Paula just can’t catch a break in the job market, and at Erik’s suggestion, she lies her way into a technician job that’s more science fiction than Home Movies’ grounded reality usually allows for. It’s an odd fit for the show, but a good button for the episode—I just wonder if the animation team didn’t over-reach by giving Paula a job with Globex Corporation. “Business & Pleasure” serves Paula better when she and Erik mirror the “you rub my back, I rub yours” situation their kids are in, with their first two scenes seizing upon some low-key, scruffy improv that sells the awkwardness of their situation. Their Abbott & Costello routine about Paula’s prospective employers (“That’s Strange.” “No, that’s next week.” “Well, I’ll Drink To That” “That’s the week after”) plays so, so well to Erik’s hokey-dad sense of humor. Though not as end-to-end enjoyable as the episode that proceeds it, “Business & Pleasure” succeeds at drawing lines between the tightly knit characters of Home Movies, determining which can be crossed safely—and which cannot. And with the show’s world set to expand in the coming weeks (or at least expand to reintegrate some characters we haven’t seen since last season), it’s important to shore up the links between the personalities that have played the biggest role since the show was in Squigglevision. H. Jon Benjamin has played seemingly dozens of variations on the McGuirk-Lynch friendship, but each one feels unique. He’s the perfect scene partner in that regard: Bringing out the best in his co-stars, making himself look good by making others look better. Further proof that you can learn everything you need to know about Home Movies from “Hiatus”: The way Cynthia gets stuck on Brendon’s off-the-cuff “awesome”—and Brendon’s inability to stop saying “awesome”—is the quintessential Home Movies joke. “Duane, watch the others.”—Home Movies resident rock savant is already on his way to being Eddie Van Halen in the “Hot For Teacher” video.